The latest news from the 49th! "They’re pathetic. There were almost none. There’s a couple million people in the surrounding communities and to have those few tells you the real momentum of this movement has really died. The same has been happening at our office where they come every Tuesday. There’s less every week." Republicans at the event also said it is critical for them to continue to win Orange County. Issa told the crowd. "“If not for Orange County, I might be standing here, but it wouldn’t be as a congressman,” His district straddles Orange and San Diego counties, and he was sent back to Congress by just 2,300 votes in November. Read the LA Times article about the event here. We had over 220 people at this week's rally. Ellen Montanari reminds us, "We have far and away the largest continuous rallies in the country!" 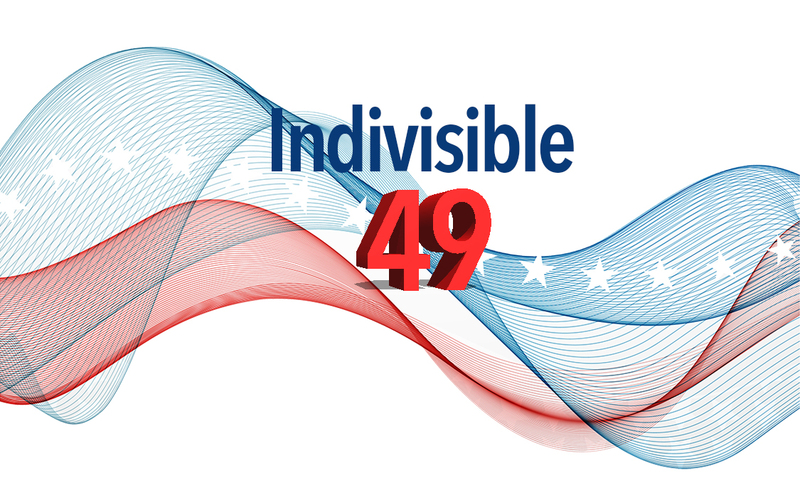 Hooray for Indivisible 49! Photos of our intrepid members this week. 10News reported on relationships that are developing during our weekly rallies at Issa's office. Just another perk of attending our rallies! We had a great turnout for out first full membership meeting on June 11. Click here for a summary and photos of the event. If you attended, we would appreciate your feedback via this quick survey. Thank you! Thank you to the many members who represented us at the Vista City Council Meeting this week. Before our members even had the chance to speak, the Council assured us that our permit to continue protests at Issa's office would be renewed. Still, many people spoke eloquently on our behalf about our right to free speech and assembly. Democracy in action is a beautiful thing! Video of the meeting is here. The silence is deafening. Silence from Issa on this week's shooting. Silence from the GOP on gun control, on obstruction of justice, on the health care bill. Why aren't they outraged? We are! If you are making signs this week, include a picture of Issa with duct tape over his mouth to signify his silence. Organized by the North County Immigration Task Force, this meeting will work on developing a county-wide strategy to stand together to fight back against hate and for in our communities .RSVP required. MoveOn.org is organizing Cookouts all around the country this to create opportunities for local Resistance groups to come together with friends old and new. For more information and to RSVP, click here, and look for the Encinitas listing. Read the Organizing Strategy which represents our current activities, our vision, and the sum total of what we can and are doing together! The fate of the health of millions of Americans is being decided behind closed doors in the Senate--with no public hearings and no budget score. Our Senators oppose the bill. But it's not enough! Read the complete briefing here to find out what else can be done to stop TrumpCare in the Senate. Call your Senators and say that talk is not enough. We expect them to withhold consent on all business and filibuster by amendment until there are hearings and a CBO score for the ACHA.